I'm continuing my series of guest posts this month to let you meet some of my favorite bloggers. For March, in honor of her birthday month, I want you to meet my friend Liz Taylor (not that Liz Taylor). Unlike the other bloggers who have posted here, Liz is not part of the Arkansas Women Bloggers group (although I'm sure she would be if she lived here!) I actually knew Liz IRL before she even had a blog. That's "in real life," mom. Liz and I used to work together and she is a fellow mom of twins, so that right there is reason enough to love her. Please check out her blog Live A Red Hot Life and show her some love! There's nothing quite like a birthday to help you take stock of your life. In 2010, I turned 40. 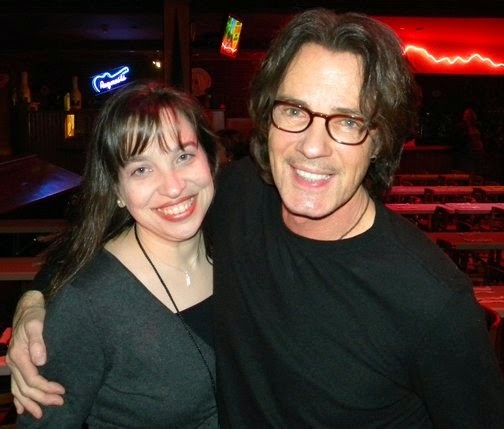 To mark that milestone, I did something I'd been wanting to do since I was 11: I signed up to meet Rick Springfield, my first love. It was amazing, and he was as cool in person as I thought he would be. The photo of us together can be described in one word: bliss. Well, that's how I would describe how I felt at the time. He might remember it differently. That day was really more than just a "girl meets her favorite rock star" moment. It was an epiphany. I had spent the five years leading up to it devoted to the needs of my family (like Rhonda, I'm a mom of twins) and to my job. I rarely took time for myself. I believe with all my heart that self-care is essential to surviving in this life, but I had been doing a lousy job of it. On that day, I did something for myself and it felt great. Over the next year, I did a lot of soul searching and it became clear to me that I wasn't happy. I began a quest for a "Red Hot Life" -- one where I felt truly alive. Because if I wasn’t happy and full of life, how could I be the person I needed and wanted to be for those who depended on me? Sure, some people do it, but to me that’s not really living. I decided that I needed to make some pretty big changes in my life. So I did. And I did them pretty much all at once -- I'm crazy like that. In 2012, I reluctantly ended a marriage that was not working, and I left my job of 18 years and found a new job that allowed me to move back to my home state with my kids to be closer (but not too close) to my family. It's been about a year and a half since I made those changes, and I'd be lying to you if I said it was easy. I made a list last year, My 2013 Red Hot List, of things I needed to do to overcome some of the challenges I faced in my new life. I haven’t completed it yet, but I'm making progress. People have told me how "brave" and "courageous" I am to start over. I think what they mean is "you're nuts," but I appreciate the support nonetheless. I have tried to use my experience to help inspire others by blogging about my story. My posts are infrequent because life is hectic, so when Rhonda graciously asked me to be a guest blogger here, I wasn't sure if I really qualified! But I am very grateful for the opportunity to encourage others, so thanks Rhonda! It has been four years since the day that started off my journey to a Red Hot Life. In fact, I turned 44 earlier this month. A few days before my birthday, I asked my friends on Facebook to describe me. I wanted to see if their perceptions matched with my reality these days. They used words like "smart," "in love with Rick Springfield," "funny," and "successful." One word that was missing? Happy. But that's OK. Because the only person who really knows if I am happy is me, and that answer varies by the day. That's just the way life is. I know that I'm on the right path, and I plan to stay on it and see where it leads. Liz is a working mother of three boys, including fraternal twins, who lives in Virginia. Read about her pursuit of a Red Hot Life and her love of Rick Springfield at Live A Red Hot Life. Rhonda, I figured out "IRL" before I moved on in your post. (You're note gave me a chuckle.) I enjoyed reading Liz's post, too. I think all of you bloggers are just awesome. I wish I had had the opportunity to do something this cool to record my feelings and my life when you were a child.